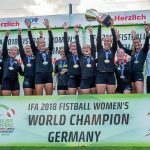 Last day of the IFA 2018 Fistball Women’s World Championship: altogether, four matches will be played – the final, as well as the matches for the third and fifth place. And, for the first time, the winner of the President’s Cup will be determined. Switzerland and defending champion Germany have advanced to the final, winning their semi-final matches against Austria and Brazil, respectively. Both games were nail-biters that went over five sets: in the first semi-final the Swiss team prevailed against the Austrian hosts, and then – in a re-match of the 2016 final – Germany won against Brazil. For Germany, it is the seventh participation in a final, for Switzerland the third. One time, in 1998, the two teams already met in a final – at that time, Germany won the title. Austria and Brazil, the losers of the semi-final encounters, are now facing each other in the Bronze medal match. Argentina and Poland will play for the fifth place. In the final of the newly established President’s Cup, the Czech Republic will take on newcomer New Zealand who has demonstrated great potential. The winner of that match will finish ninth in the tournament. The President’s Cup is a new initiative to give smaller fistball nations the chance to determine their winner. We have seen great fistball at this World Championship thus far, and are looking forward to a great final day.